Currently the UK establishment appears to be reeling, apparently stunned that its own clarion call for Remain has gone unheeded. There is even one column in the Guardian describing Cameron’s resignation as a “European tragedy”(though to be fair they mean it in the Classical context). Other Guardian pieces continue the theme of bewilderment. Rafael Behr calls the vote a “Brexit earthquake”. There are opinions offered from Polly Toynee, Suzanne Moore, et al, predicting everything from “exciting” times ahead (Moore) to the entire destruction of western civilisation as we known it(Toynbee). Actually Toynbee’s gone full Cassandra today and is rending her garments while predicting “catastrophe,” and, with the remains of her hubris, continues to blame the Brexit vote almost entirely on fools and racists. Apparently you simply can’t have had a good or honourable reason for disagreeing with Polly on this. It’s impossible. If you voted Brexit – you’re a fool or a racist. Polly knows it, even if you don’t. Most of the less hysterical column inches and broadcast media can be distilled down in to the conclusion that the meaning and ramifications of this vote are still hard to predict and that the days, weeks and months ahead will be interesting. With which view, for once, we entirely concur. But let’s be honest, anything that results in David Cameron resigning as PM can’t be entirely bad. I see a splitting into those who choose to live under a fear-managed and deceit-dictated narrative and those who choose to live – even though this uncovers fears that challenge us to grow our perspective. The same ‘events’ are harvesting different outcomes. While it may be that ‘shadow power’ has its game virtually in the bag because the nature of our conditioning leaves us powerless to do anything it has not set in motion, accounted for and set up to use to serve ITS agenda, I feel the game itself is a deceit by which to react from a false foundation and reinforce it thereby as true currency. We perhaps know that divide and rule operates to undermine or overwhelm communication with conflicted fragmentation – like a jamming signal. We also know that fear and guilt with corresponding rage and powerlessness are the trigger points of manipulative diversion. Will we put this together to see that it is our consciousness that is set in fragmented or conflicted identity and purpose while a jamming signal operates a ‘darknet’ in which to run a narrative overlay of ‘sleepwalking’ under conditioned dreams of a life that rarely connect to any intimacy of being – or true life shared – and subverts or denies any such life from growing – lest the jamming signal be revealed in its actual purpose and exposure reveal the truth that we (are conditioned to) believe will damn us or negate us or reject and sacrifice us – (catastrophic outcome etc). Un-owned fear operates self-fulfilling prophecy. Shadow fears grow in the dark. While asserting and defending a persona seeking validity, while the actual undercurrent communication feeds the evasion of transparency and self justifiction for unaccountability as ‘power struggle’. Or indeed as power sacrifice of individuality to collective power struggle, or state power monopoly – in return for protection from the more extremes terrors and violations of unchecked power to harm. These issues are not theoretical to me – but revealed in my thought and reaction because I am noticing what is undercurrent or active beneath the narrative focus that I no longer identify exclusively in as myself or even my thinking. An unwatched mind can easily drift into and become prey to uncreative or self-destructive loops of thought and behaviour. Noticing thought and accepting feelings, opens a basis from which not to be compelled to react from them as true. Or else one plays the blame game and engages the struggle to outsource guilt to anyone or everyone else – and define oneself over and against the hated. Perhaps the reason the young voted to remain is that they have no experience? This is why I am fundamentally against lowering the voting age to 16. People that age have no real idea of consequences, let alone experience of them. Mostly still living with parents, not in full time employment and bills are someone else’s responsibility. Back in the 70s I was too young to vote on European cooperation, but the idea appealed because being young and idealistic I wanted to see positive change in a time when the cold war loomed over all our shoulders. 40 odd years later, I can see this is not working. We didn’t join the euro, luckily. The uk persistently tries to avoid commitments towards the EU and the EU continues on its idealistic path like a ship without a rudder or navigator. It makes me sick that I now am threatened again by looming nuclear conflict as the US leads the EU and nato against a resurgent but relatively benign Russian. I would love us to all work together for the benefit of mankind. That’s not happening, it will never happen while big business has any control over governments. Let’s reform UK politics, get things better here, then things outside will assume their proper perspective. The photograph I think is wonderful. It really captures a moment of dawning recognition on the faces of those who I assume are loyal appartatchiks. Can someone identify them for this Merkin? My ber-cynic says it will be an opportunity for the government to get rid of any laws it doesn’t like under the rubic of ‘the EU forced us to do it’. Obviously anything relating to ECHR goes. A shopping list – FOI laws? Employment law – goodbye employee-friendly EU laws, hello employer-friendly employ-at-will laws. Rdeuced regulation of the financial industry. Goodbye environmental assessment for major construction projects. Goodbye ‘EU socialist’ things such as free health care, care for the infirm and disbabled? Some of these were no doubt long wished for, but now the corporate-run government has perfect excuse. Where do such ideas come from? The National Health Service in Britain long pre-dated the EU. And it was imposed on a very reluctant medical profession by a Labour government, and specifically by a former coal miner from Ebbw Vale. Did you think that the EU bureaucrats dreamed it up? Do you imagine that any elected government in Britain will be less responsive to the people than the current Brussels structure which notoriously caters to the corporate lobbyists? Why suppose that the people, who have historically fought for environmental protection and against nepotism in employment, who invented free health care and established proper treatment and care of the disabled, should now turn against these things? Do you accuse the people-the voters- of having produced the TTIP? Do you imagine that it those most vulnerable to unemployment, and poverty who oppose welfare legislation? You appear to think that the EU has imposed higher wages, decent services and other traditional demands of the Unions and the Socialists upon a reluctant working class who would rather not have the benefits. And that now freed from the trammels of an EU Commission which gives high priority to the needs of the poorest, the poor will collectively punish themselves just for the fun of it. You shouldn’t worry: people voted against the EU because it is neo-liberal and callous, because it is authoritarian and destructive, because of what it has done to Greece, Ireland and Portugal, because it pushes for higher unemployment, lower living standards and a bonfire of environmental standards. That is what the TTIP amounts to and the EU Commission has negotiated it, precisely in order to drive Europe’s workers in a race to the very bottom. You should be grateful that the people of Britain have shown the way in this matter. Find someone else to sneer at. I agree. The EU is pushing the glabalist agenda. I can understand that many people have fears about a post-brexit government allowing GM, bad environmental laws, poor employment practices etc etc. But we the people have a much better chance of stopping “bad” law proposed by a British government than by huge EU technocracy. I hope that citizens will become more politically engaged if they can see a point to campaigning. Thanks off-guardian for allowing a forum for voices that are left leaning, anti-globalist and pro-brexit. Yes – but political campaigning and indeed, active humanity, needs to be reclaimed from the subordination of communication to power struggle within deceits and manipulations, so as restore channels of communication through which to embody a cultural renewal by the way we deal with issues. This is the opposite to the engineering of controlled opposition – in which an ‘identity’ is validated by being against something. I cannot imagine a Brexit referendum would have been allowed to be offered if it didn’t serve a power agenda – but that doesn’t mean it ONLY serves such agenda – after all everything serves only the meaning I give it – within the purpose I hold true for me – which is a re-wakening of true worth through opening communication and growing trust in a genuine willingness of relationship. One step at a time. The NWO operates the belief that destruction of traditional values and identities is necessary for the replacement with an all pervading state power that nothing and no one will be able to oppose, challenge or threaten. But I see the embrace, expansion and transformation of our true inheritance as a richness and diversity of humanity – and perhaps unbeknown to ‘them’ is called forth in refusal of the deceit writ so large in misery and destruction that in a sense brings us back to the old imprint of fear-conditioning we thought to have escaped – but perhaps to see with new eyes? I heard a hard Right propagandist, now working for the parasite caste’s propaganda apparatus in New Zealand (having done so in Australia for years) saying just that this morning. Brexit means the UK can bring in proper ‘liberal reforms’ and ‘deregulation’ etc. So, after forty years where the UNAMBIGUOUS evidence is that Free Market fundamentalism only produces great inequality, poverty, elite wealth, debt and ecological destruction, the maniacs still DEMAND ever more of the same. Everything having been ‘privatised’, there remains left only the prospect of selling off the chavs, perhaps as indentured labour or for the highly lucrative organ trafficking business. I suspect that most of the exiteers didn’t vote for sending Polish plumbers home. What they did vote for is sending unskilled Romanians and Lithuanians home and for controlling borders against tidal waves of refugees created by NATO’s hegemonic wars. Like it or not, countries must be able to decide for themselves who they allow to be residents, and not be assigned them by unelected commissars who represent the MOTU and nobody else. Also to stick a thumb in the eye of the austerians and, huge bonus, depose Lord Cormorant. Don’t forget it’s only a year since the Greeks voted twice to abandon the Euro and go their own way and it was immediately ignored by the international financial oligarchy and the EU. If people believe this limited exercise in democracy will significantly change things they are seriously deluding themselves. The Greek vote was ignored alright-by the Syriza government. The Eu is bad enough and its treatment of Greece is horrible but it takes two to tango and in Greece’s case a succession of treacherous governments have all ended up siding with the Troika against Greece’s working class. And they have done so with the permission and encouragement of the national Establishment. Which shows, yet again for perhaps the umpteenth time, that ‘democracy’, in any meaningful sense, is the polar opposite of plutocratic Market Fundamentalist capitalism. The Greeks never voted to abandon the euro. That was their problem: they simply refused to Grexit. Not honoring the vote to leave could see the formation of new political parties with a clear mandate built on a solid pro-Britain platform. Until the elite manage to corrupt them like the war criminal Blair’s entryism corrupted Labour, they could do some things truly against the interests of the establishment. At the very least they could force them to resort to gangster tactics, further exposing their true colors to weaken their support base. You have to empathise with Toynbee, she hadn’t even come to terms with her grief over the fall of Teflon Tony Blair…and now this!? Where will she spend her summers now that we’ve abandoned the Dordogne? In her villa in Tuscany. Tuscany is lost too. Poor champagne socialist. I am sure Soros will be crying all of the way to the bank. Keep drinking the Kool-Aid otherwise you might just twig what that pivot to Asia means. Congratulations! You got two for the price of one. Britain’s out and so is Cameron! Now it is time to declare your Independence from the United States. The 4th of July is coming up in a few days. That might be a good date to do it. Airstrip One declare independence from Oceania? Big Brother advises against it, and he has the surveillance equipment and hobnail boots to back it up. No-one will ever be independent of the Exceptional Empire while it exists. It lives to dominate and control-totally. That is God’s Will after all. Or it wasn’t close enough to flip. George Soros, I wonder if he’s laughing. Did he and the rest of the financial elite warn the voters to back Remain or else, while at the same time were secretly betting on a Leave victory forcing down the pound and the stock market? And did they encourage rumours that the vote was going to be rigged one way while they surreptitiously rigged it the other? All I know is that I wouldn’t put it past them. How many Syrians, Iraqis, Afghans did you graciously take into to your spare rooms?? Buckle up because it will take 2 years of endless lies / threats / propaganda / false flags/ crashing the pound / war… for the result to stand. But Brits are stubborn. A great victory :)) And Cameron GONE ! – what’s not to like?!! Bravo GB!! There will not be a “GB” at the end. There will be England, there will be Scotland (in the EU), Northern Ireland is likely to join Ireland (‘cos our Northern Irish brothers like their EU subsidies) – but GB? that’s gone. The vote split between old fucks (out) and young people (in) – with the old buggers winning it. Nothing good will come of this. Calm down. It’s very early days. And the result is not binding. If the PTB are as desperate for the UK to remain in the EU as they seem, a way may well be found. “And the result is not binding” ..& you base this on what? …your er, profound knowledge? As for staying calm, ain’t me that is in the sinking ship called England – it’s you toots – remind me how the pound is doing this morning? your toys will soon cost much much more – enjoy. edit: you’re not from the UK? We assumed you were since you run a UK-based company with a UK-based website. Our apologies. As an old left-wing bugger, who because he buggered off to avoid being on the dole under “Saint” Margaret got hit by the 15 year rule and could not vote against Brexit (and is now well pissed off he could not) just let me add my two cents. Lest we forget it was “Saint” Margaret’s heirs, the Tories, who were the original ones behind the new, neo-liberal, post-Mastricht, US multinational friendly EU that the Tory press has never stopped bashing. Tony (as in everything) then just followed their lead and made it even more US multinational friendly. Before rejoicing about the departure of PM Cameron, just think about PM Gove or Chancellor Gove for a second. If the Tories now fall apart as a party it will be another matter. But is nobody else concerned that the Blairite (i.e. Langley bought and paid for wing – or was I the only one to read Robert Harris’ The Ghost) is now using the Brexit vote to try to unseat Jeremy Corbyn? The left has just been sold down the river a second time by Brexit. The post Brexit TTIP-bound Europe will now be even friendlier for those US multinationals. eh? the Uk parliament? & “accepted by whom? I rather think things are moving on from that – looks like Ingerland is going to be booted out – very much sooner rather than later. My location is irrelevant – my use of my real name – as opposed to you & your pseudonym reflects both my honesty & your lack thereof – democracy & its underpinnings such as this web site relies on transparency – it is evident that you do not buy into this. Another little turd, anonymously sniping from the sidelines. Catte is right, the result of this referendum is not binding and the European Parliament may ignore it. 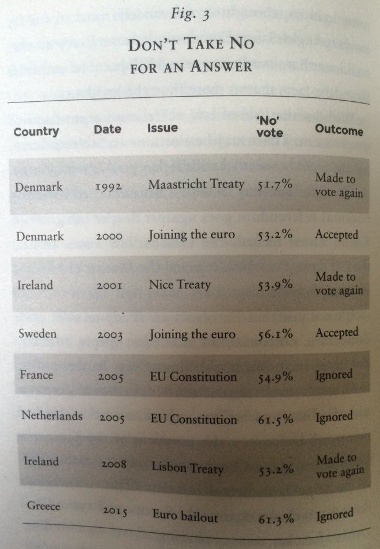 When ever has the EU recognized a referendum they lost? Name one, people! A lot can happen in the next two years … let’s wait and see. or maybe at the end of two years there will be no EU? I like the way senior citizens are described as ‘Old Fucks’ and ‘Old buggers’ a little ageist wouldn’t you say? That could be construed as hate crime. It seems that political correctness is not to be extended to those elderly people who have worked all their lives and insist on having a say in their country’s future. Political correctness protection is never extended to those who disagree with the politically correct. The split seems to have been between people who work and people who live iff the work of others, with the workers voting to go it alone. Why? Because they don’t like what life in the EU has become, because they miss Unions and the ability of governments to respond, quickly, to social crises such as structural unemployment. They miss the possibility of social mobility that the privatisation of education exemplifies and they are horrified by the Dickensian era Poor Laws currently being rediscovered. Many people are doing very well in Britain, but most are not and society itself is falling apart with callous cash nexus once more replacing warmer sentiments and finer feelings. The vote may not be binding but it would be a great mistake not to be bound by it- it has a lot more credibility and authenticity than the policies being pursued by Westminster. The challenge is to the Labour party- the working class has spoken, will it follow their direction or pass another vote of non-confidence in the people? AS to the rest of the EU: the likelihood is that France will elect an anti EU President next year, opinion polls there already show that the Union is widely detested by a majority; Spain is voting next week, Italy and Germany are places where EU support is crumbling, Portugal and Greece are virtually under occupation… the sinking ship is not Britain but the bureaucratic Hapsburg hulk to which it has been moored for forty years. A good answer and pie in the eye for Mike Parr and others like him (or her or it). ” … Geographically, Brexit is a vote against invaders along the entire shoreline of the island save for Liverpool; Cardiff; the upper-class neighbourhoods of Plymouth and Exeter; and Brighton. Excepting also Scotland — but there the Remain vote turns out to be a vote to be in Europe, independent of England. If the Scottish referendum were to be called again now, the Scots will vote to leave the United Kingdom and accede to the European Union. Like Crimeans from the Ukraine. In Cornwall, where Cornish independence awaits revival, the vote against Europe – 56.5% to 43.5% — is a vote for Cornish independence of London. The smaller margins for Brexit in Wales (5 percentage points) and in England (7 points) say the same thing, with less conviction. … Brexit is a vote against the apparatchiki and siloviki of North Atlantic Treaty Organization (NATO) politics, including David Cameron and Hillary Clinton. Between now and November 8, election day in the US, reading newspapers and television news about the chances of Donald Trump will be as pointless as Cameron is this morning. Helmer probably could have said that the young prefer Remain because being part of the EU is all they have ever known and their self-interest (particularly the self-interest of the Oxbridge university youth set) is focused on visa-free travel for work, study and play through the touristy parts of the EU. Cultivating inter-generational hatred is a relatively novel ‘Divide and Rule’ tactic for the ruling parasite caste.